Over the year, my taste in clothing had evolved from lots of black to barely any black. Instead of black I find myself veering toward various shades of gray. Sometimes cold winter days without the sun can be depressing already, I really don't need more black. For autumn, I am in adoration with long comfy cardigan. 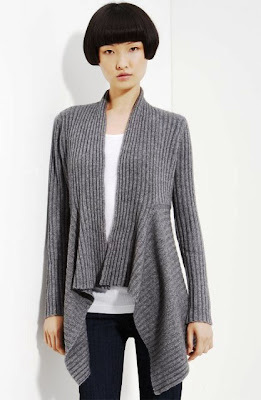 I got this cardigan from Ted Baker a while ago and love the soft drape of this piece. Loving all these cosy sweaters! Grey is amazing especially on those sweaters! I love gray! 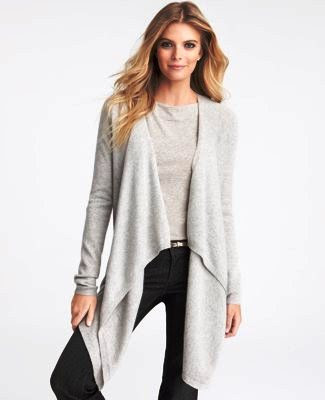 I probably have 6 different gray cardigans, and would probably buy more. They are fabulous! seriously can't go wrong with grey!! I love your version of it. I think that your style would be perfect for this contest: The Le Thrift Dress Smart Contest! All you have to do is post a photo of yourself in a thrifty look and tell us how much you paid for it on our Facebook page (Facebook.com/lethrift)! You could win a $50 gift card and be entered to win a grand prize of $200! Hope you enter, looking forward to see what thrifty look you put together!